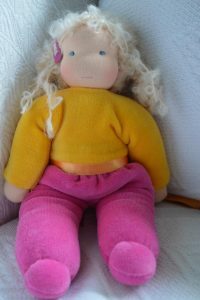 First doll of 2017 and It’s a Boy ! 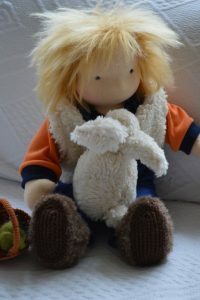 This little boy with his wild hair just loves his bunny. 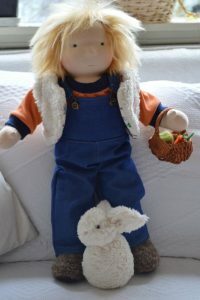 First thing in the morning he collects vegetables from the garden in his basked to feed his dear friend. 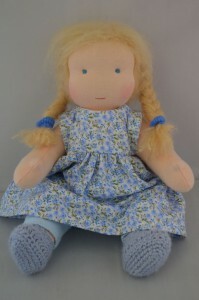 With the summer holidays in sight for some children it is a time to say goodbye to their kindergarten teacher. 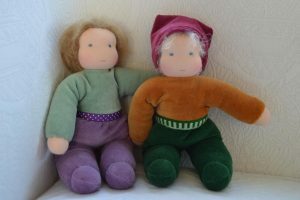 After the the summer they will go to the big school and the real work begins. 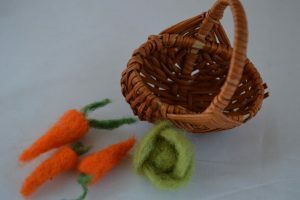 At our school it is tradition that the children give their teacher a gift. 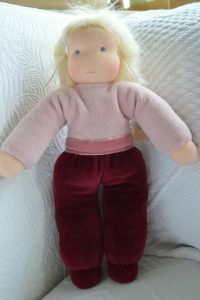 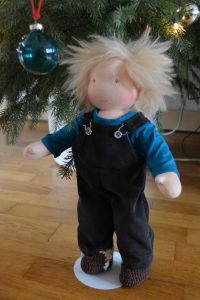 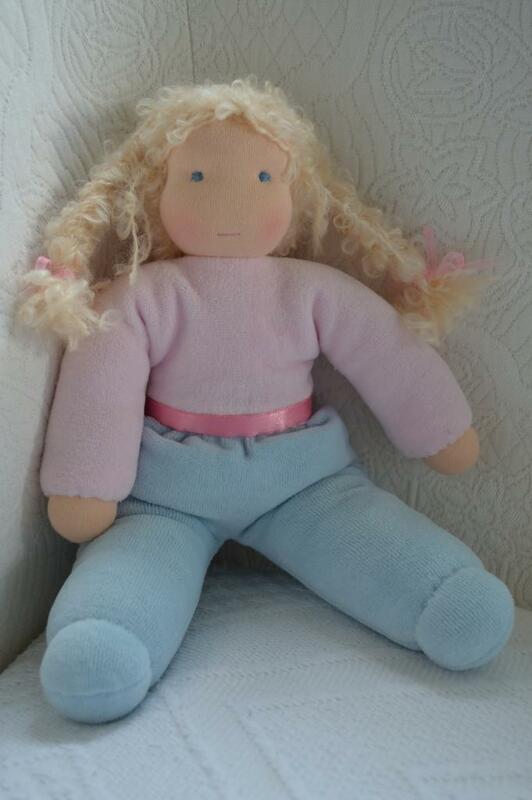 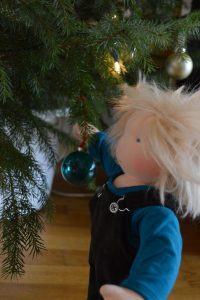 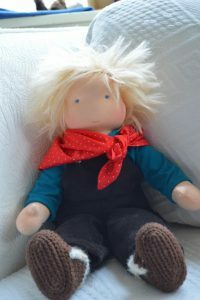 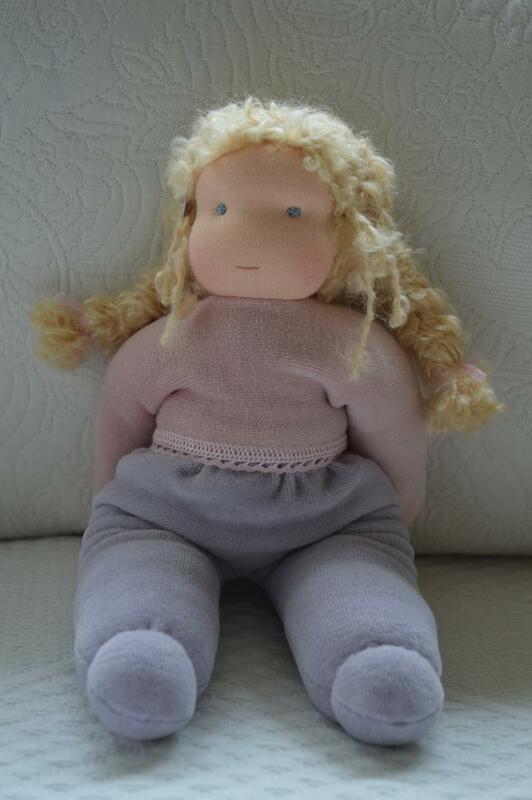 This year I was asked by the parents to make a doll for one of the teachers. She should look a bit like the teacher as she might have looked as a little girl. 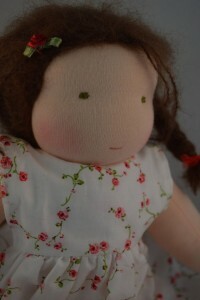 I got to work, dark hair and green eyes and a sweet summer dress. This is what she looks like, she will be presented at the last day of school. 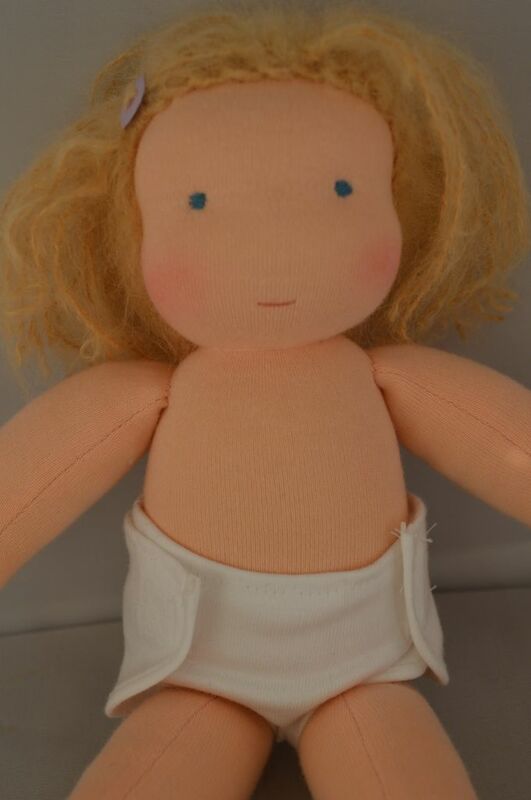 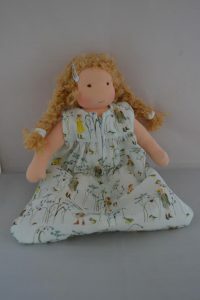 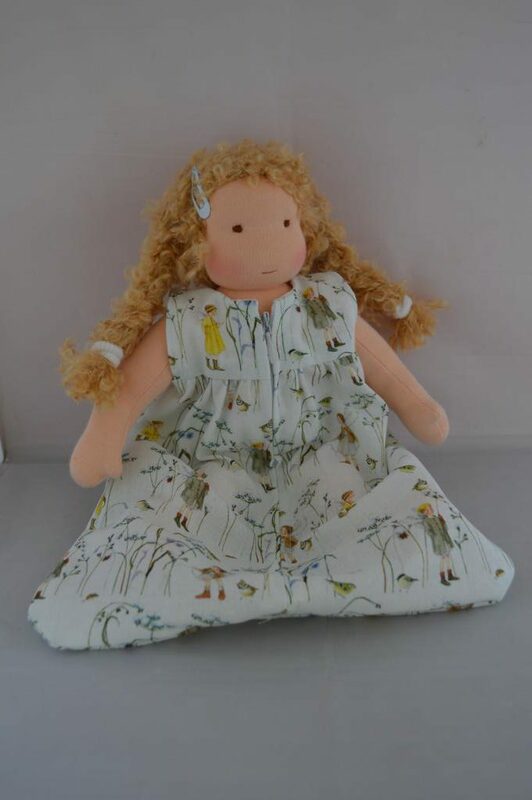 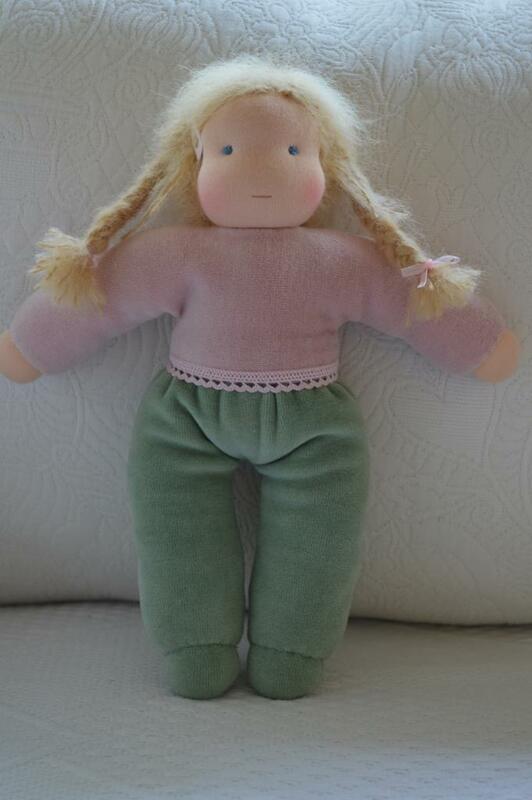 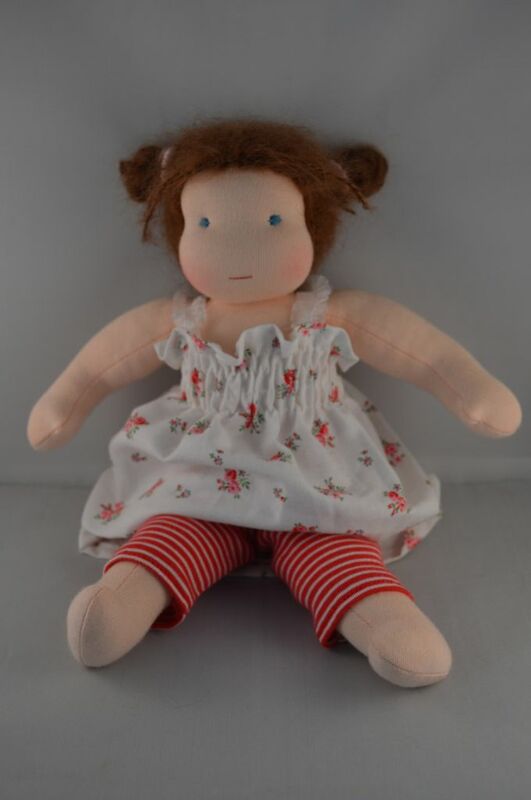 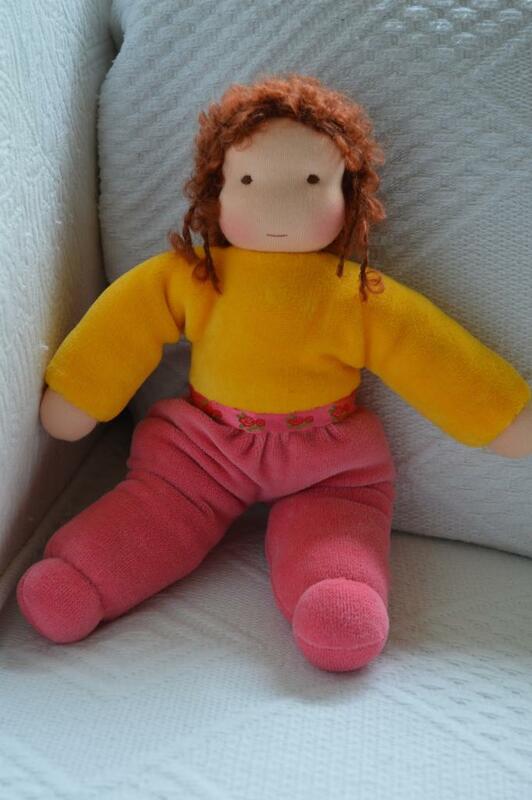 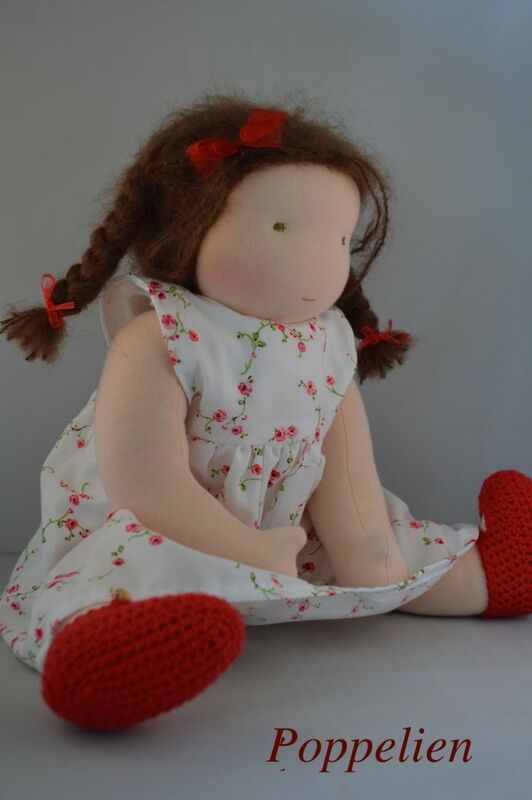 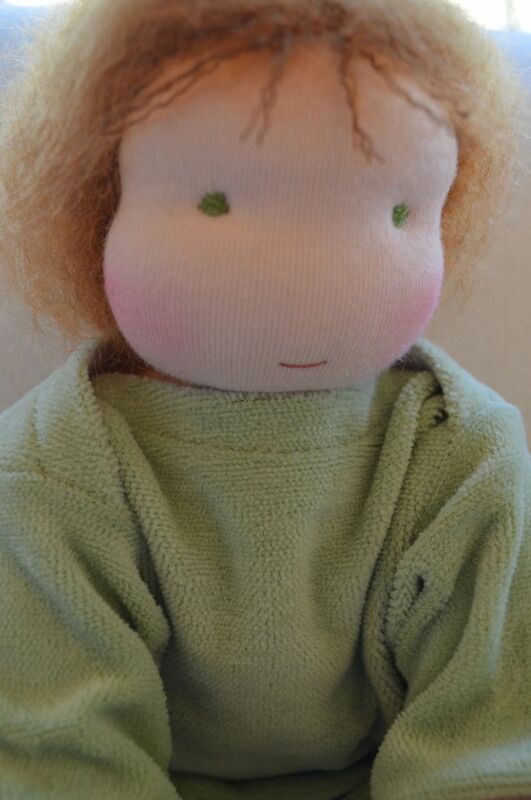 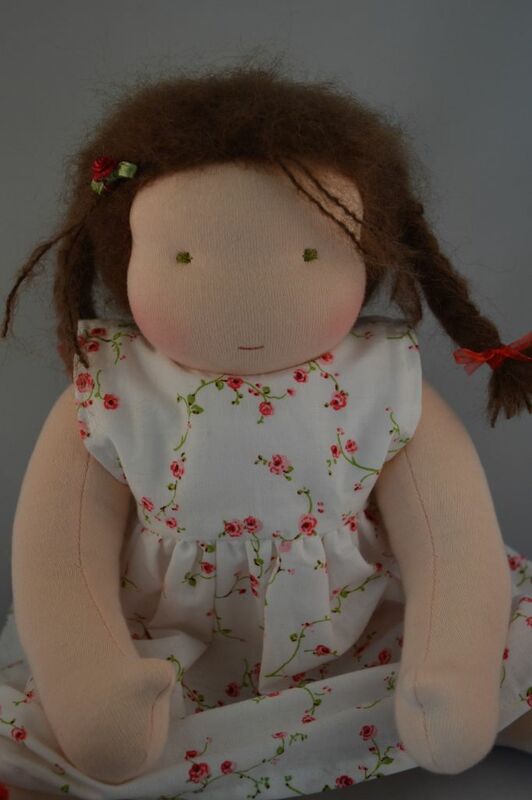 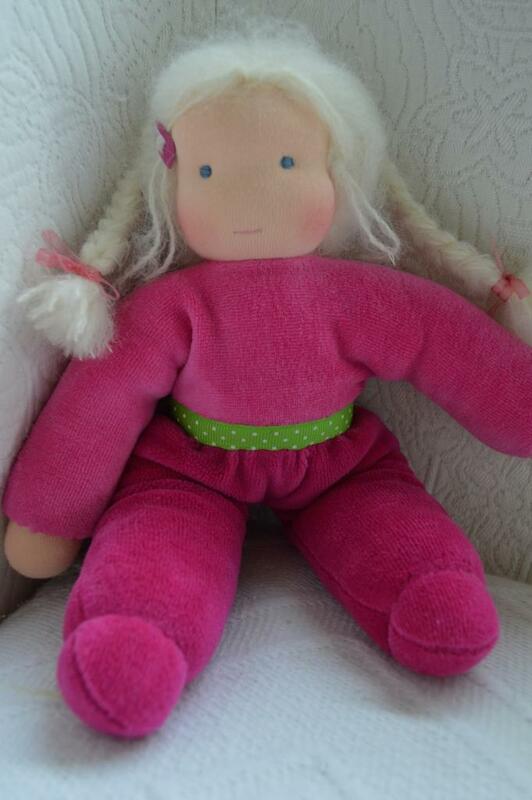 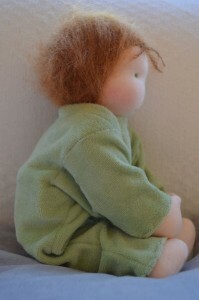 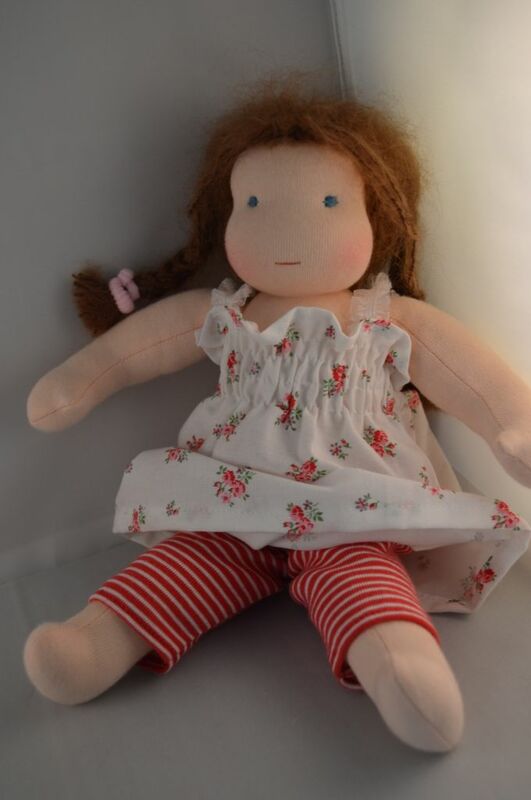 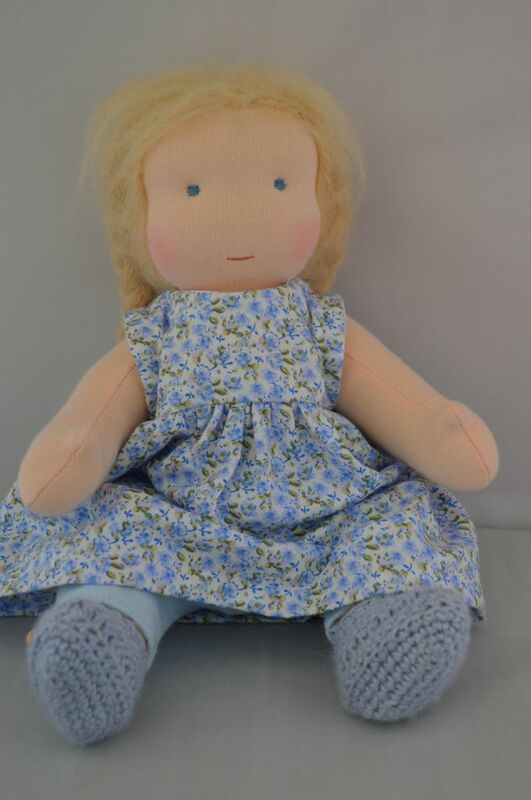 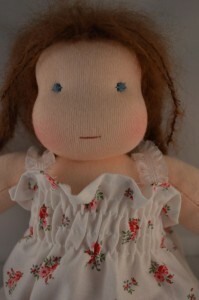 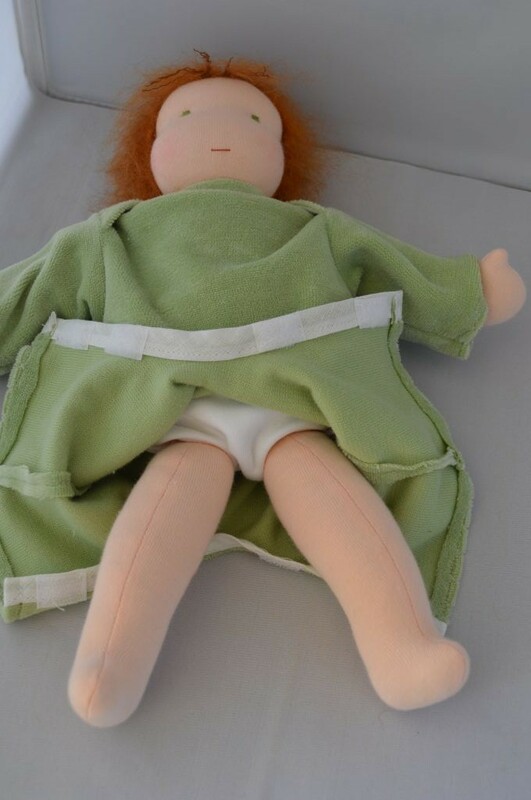 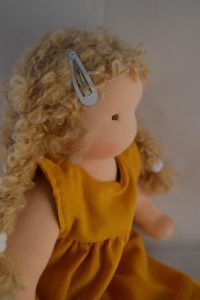 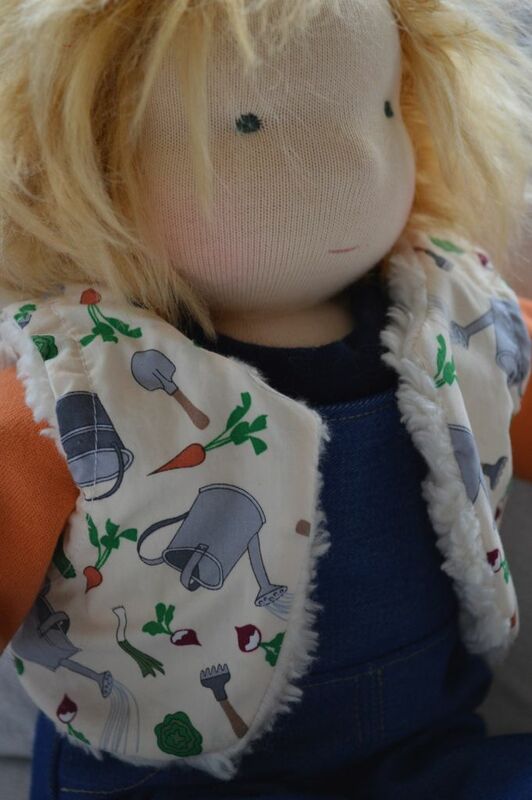 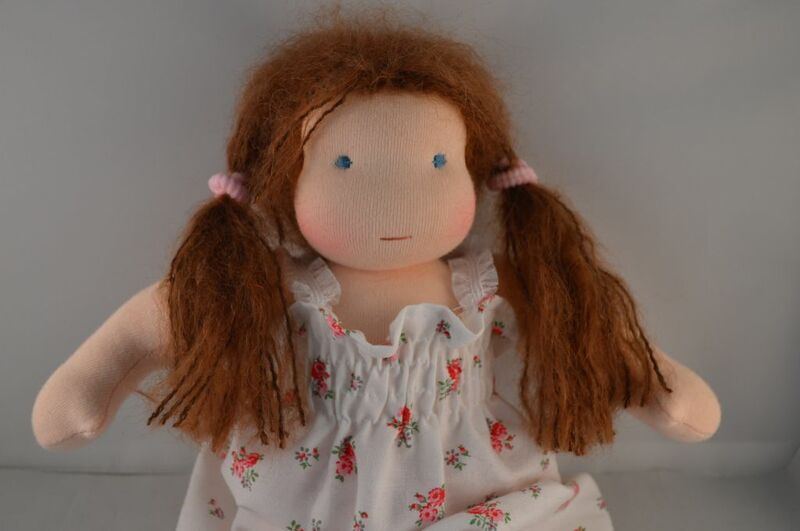 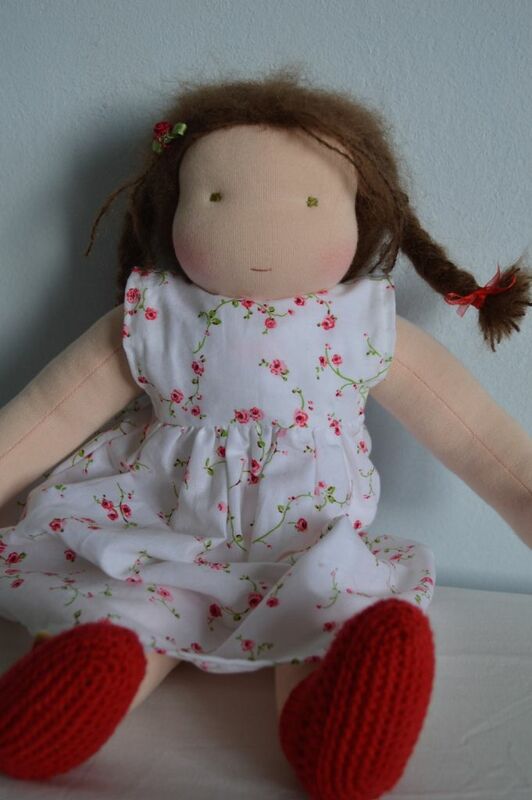 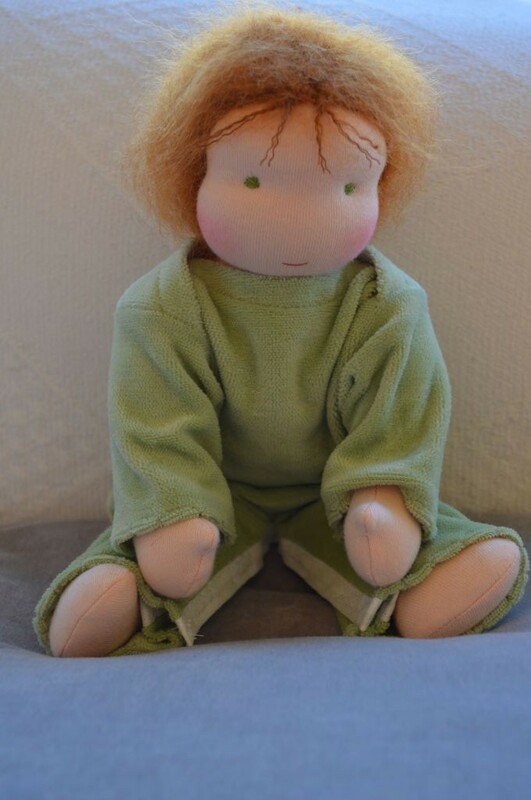 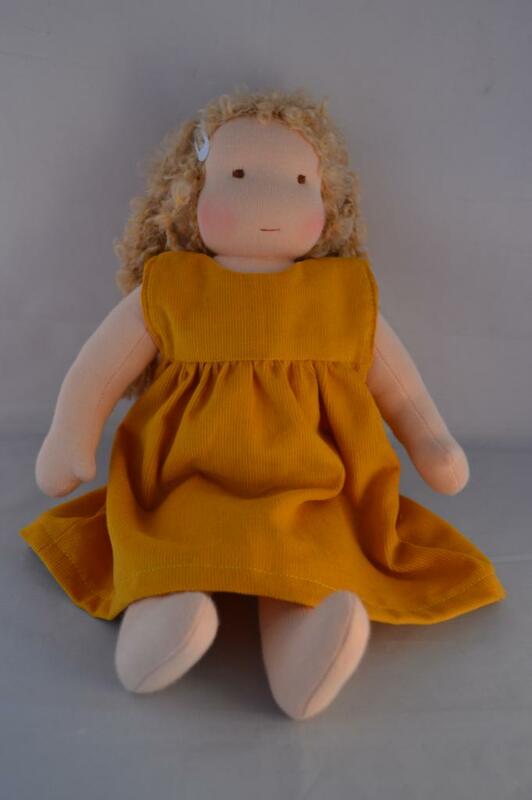 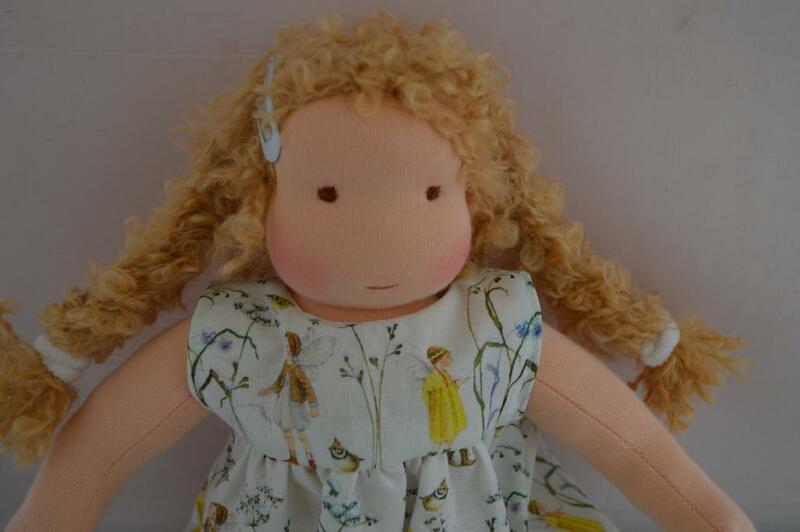 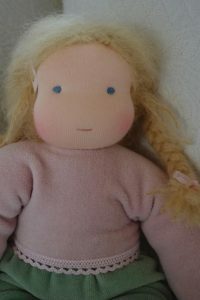 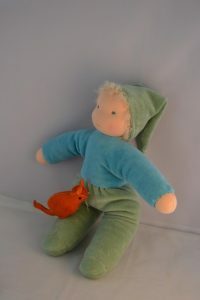 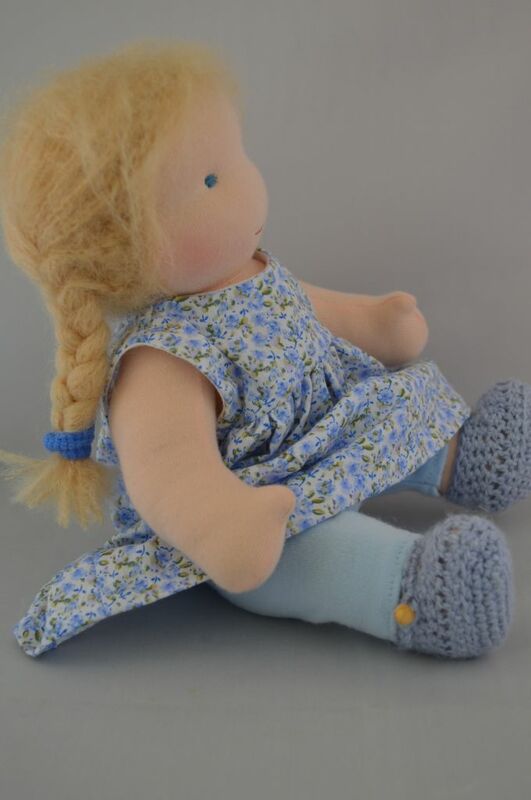 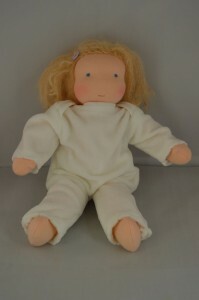 This little baby organic doll I made with auburn hair and green eyes, she wears a soft green playsuit that can easily be opened at the bottom to change her diaper. Please meet Suze, at least that is what I named her for now, she is a fun loving little girl. 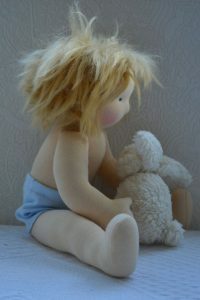 She loves her little teddy and never goes anywhere without him. 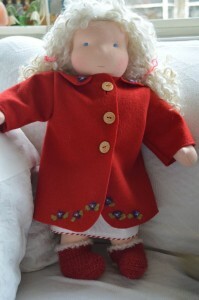 For playing outside she has a warm wintercoat in her favorite color: red. 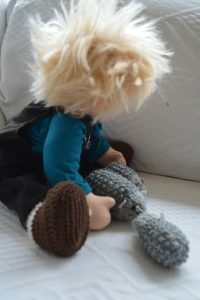 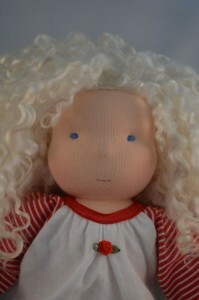 She is the first Steiner doll I made with Wensleydale locks I made my first weft with it and then crocheted them into a wig. 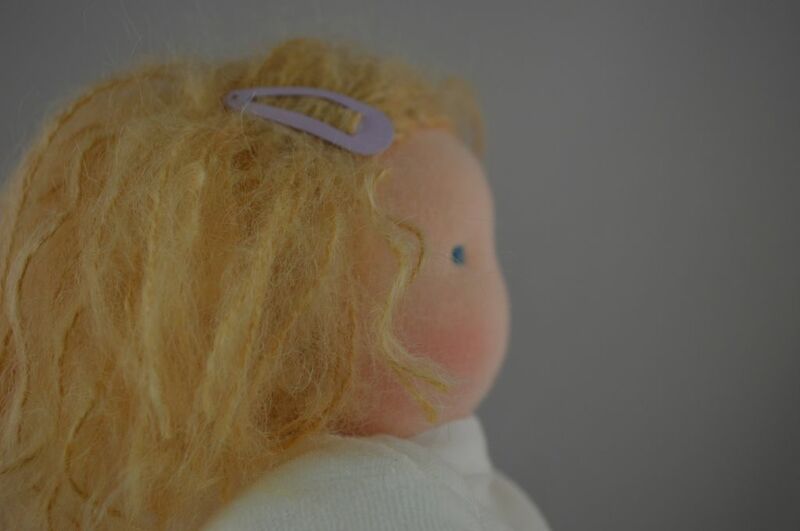 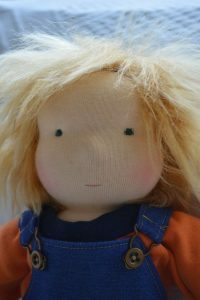 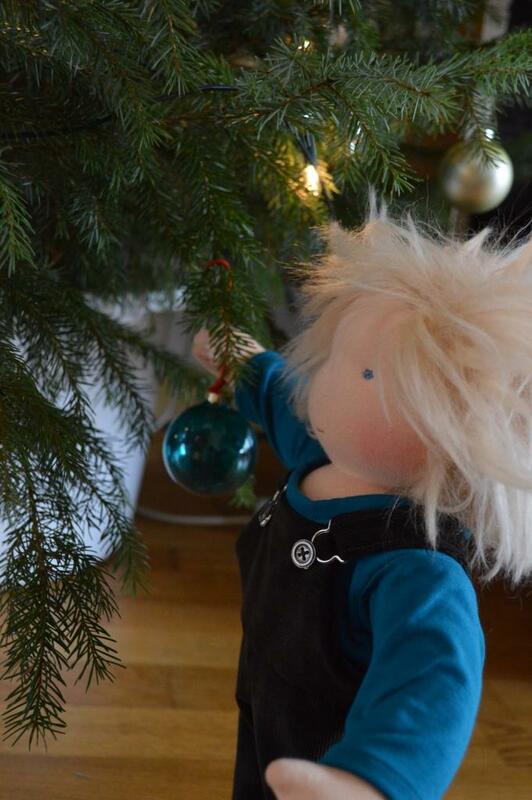 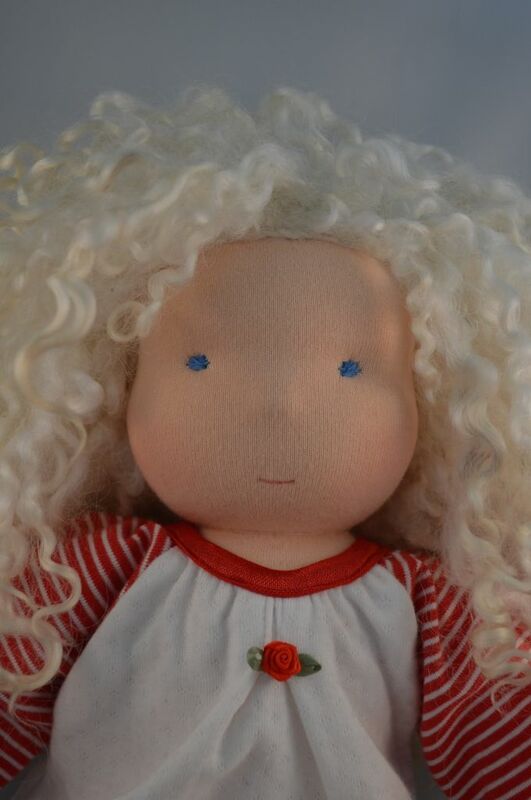 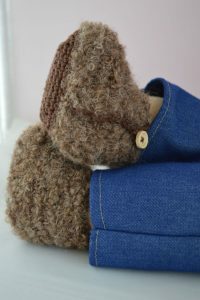 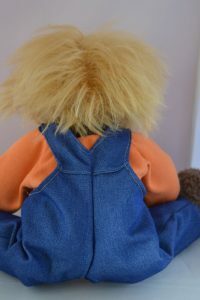 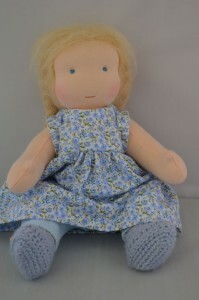 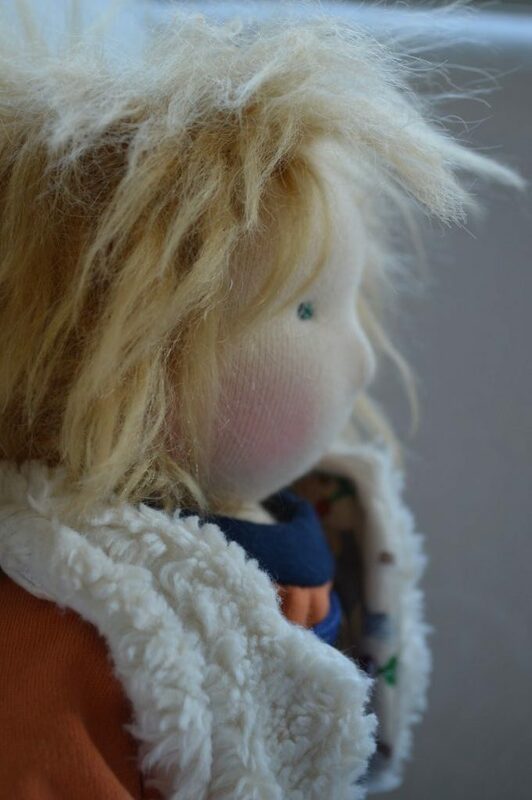 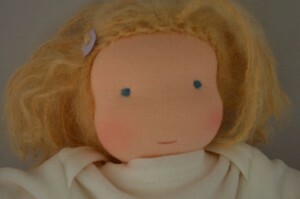 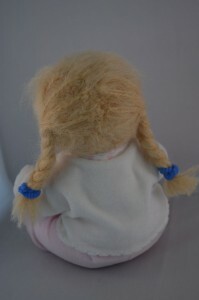 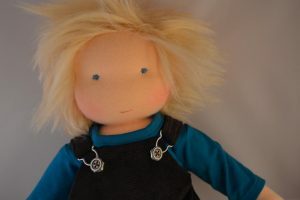 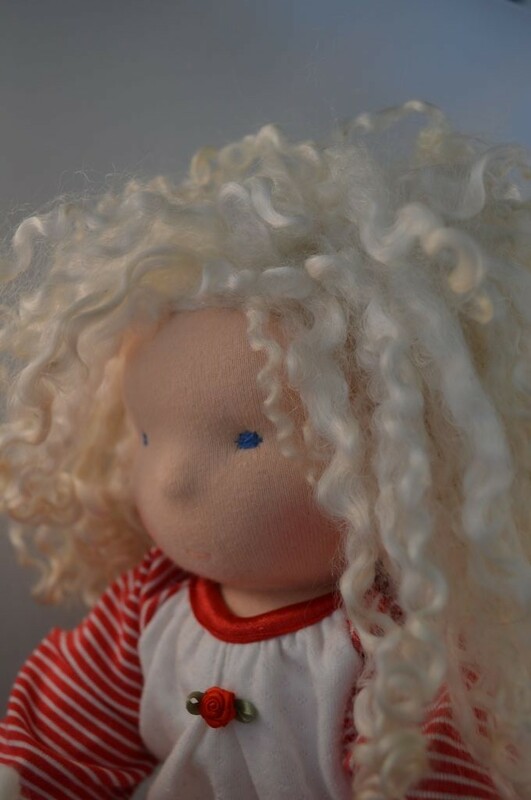 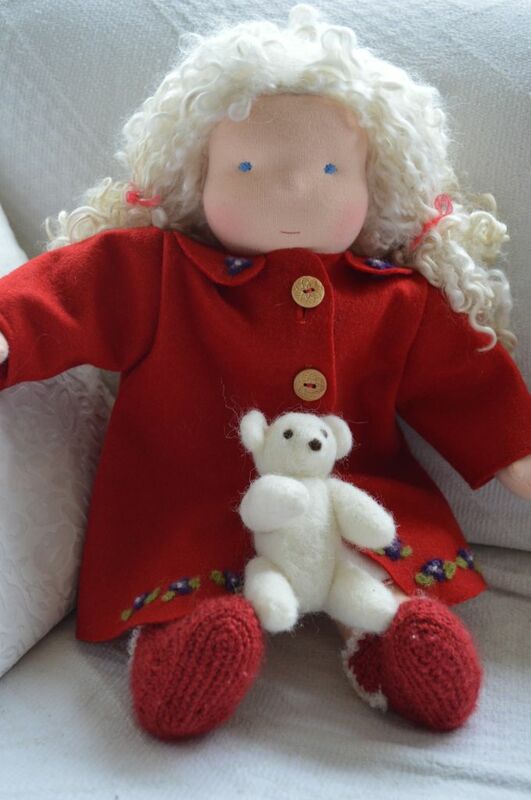 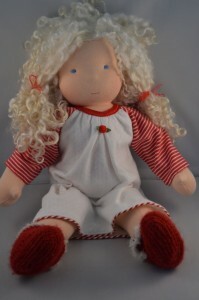 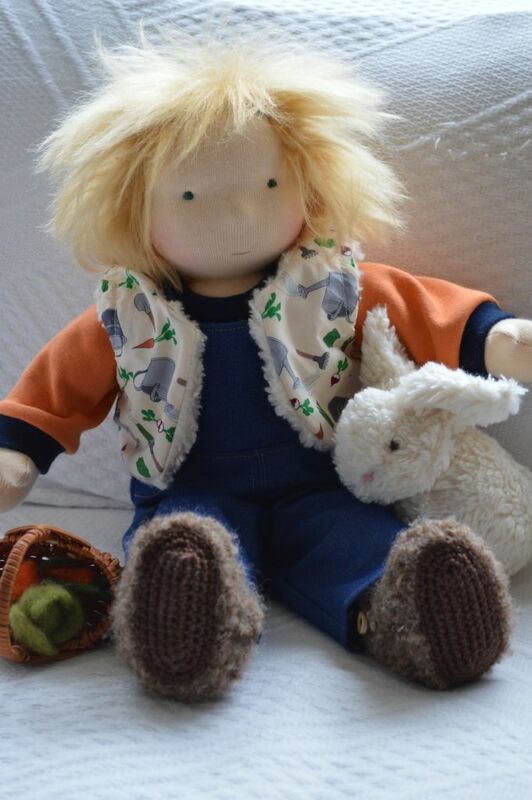 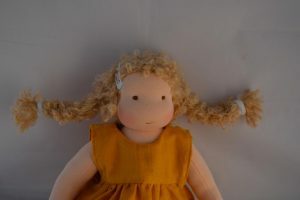 Very experienced doll makers told me the Wensleydale locks keep their shape and can even be washed and brushed. Little Suze has found a new home. 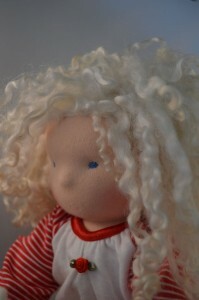 This sweet baby is already at her new home in time to be a St. Nicolas gift.